90% great experience. Expected floor to be clean in bathroom and it was not. Expected porter to bring bags to lobby as requested and he did not, I was handicapped, and this was a burden. We always tipped well I do not know why he did not bring them down while we were eating as requested. It was a very luxurious hotel, well located. Bathroom floor dirty, Porter did not return for bags as requested. This hotel is close to resturants (outside of the hotel) so you can eat good food and is close to conference center for business and is very clean. Very nice and new roomsand clean. I have had. They need people that now how to cook and for how long. Downtown Indy. Close to everything, shopping, sports and great resturants. Capitol Grill in Hotel was very good. Room service was prompt and good. Staff was very attentative. Great staff, great decor, room was very nice. 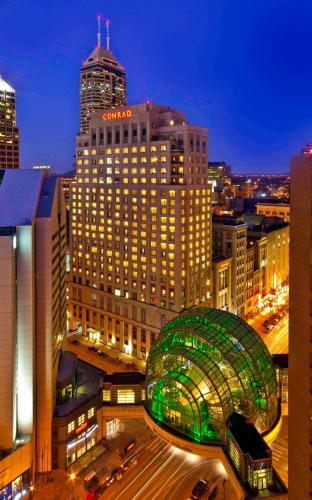 The Conrad Indianapolis, situated in the center of downtown, is eleven kilometers from the Indianapolis International Airport. 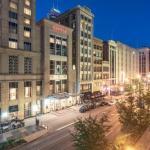 Monument Circle, State Capitol, Indiana State Museum and several retail stores are within walking distance. Meeting rooms and ballroom of the hotel are connected to the Indiana Convention Center, Circle Center Mall, RCA Dome and the Artsgarden via a skywalk system. The hotel has a florist, concierge desk, baggage storage, automated teller, lounge and elevators for added convenience and comfort. Video messaging, express mail, notary public and secretarial services are also available within the premises. High-speed Internet is complimentary. The Conrad offers fifteen private residences and 241 guest rooms. Each room has a mini-bar, laptop size safe, 42-inch flat screen HD plasma television with remote control, slippers and bath robes. King Bed Presidential Suite features separate bar service, dining and sitting areas, kitchen and powder room. The 10,000 square feet of event space has state-of-the-art equipment. The onsite business center is equipped with a modem, printer, fax, photocopier and typewriter. You can enjoy breakfast, lunch and dinner at The Capital Grille®; and live entertainment on weekends and drinks in Vitesse. Spa Chakra spa offers relaxing massage therapies and Guerlain skin care products. The Conrad provides special menu and videos for children. 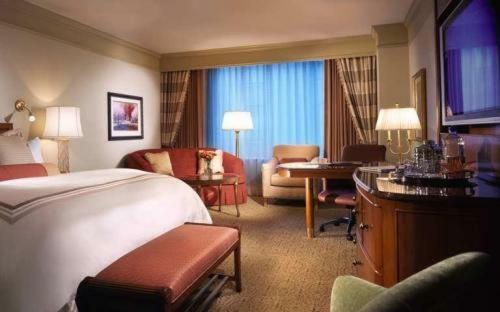 This upscale pet-friendly hotel offers a whole range of facilities for a pleasant stay. Almost all guests were impressed with spotless well-appointed accommodations, well-maintained bathrooms, state-of-the-art business facilities, food, spa, gym, polite and friendly staff, and location. However, a few visitors griped about stained carpets, dirty bathrooms, broken sink, poor massage and customer service, spotty and slow Internet, mal-functioning toilets and overpriced valet parking.